The following article has been written by Chinmay Rahane. The classification of birds into different species, known as avian taxonomy, is a fluid subject. Bird species are being split quite frequently these days, often due to advances in molecular methods. These methods are similar to DNA testing in human beings, by which one can make inferences about the ancestry of a person. When an existing bird species is split into two of more new species, this can fun for some of us who get new species added into our life-list just sitting at home (these are known as armchair ticks). However, since the new species cannot all share the same name, all but one of them has to be renamed, which means that birders have the frustrating task of learning new common names. Most recent taxonomic splits are based upon a combination of molecular, vocal, plumage and distribution differences. However some authorities like Handbook of the Birds of the World (HBW) and Birdlife International (BLI) make heavy use of morphological (i.e. plumage) differences to declare splits in species. One such split proposed by the recently published Illustrated Checklist of Birds of the World affects our Jungle Babbler Turdoides striata, specifically, the somervillei race which is found in the northern Western Ghats, from the Surat Dangs south until Goa. The Birdlife International 9.0 taxonomy has now elevated that race to a full species, and have renamed it as Black-winged Babbler T.somervillei. In this case, no studies have analysed the DNA of this bird. In the past there has been no suggestion to elevate the race to species status. The Handbook of Birds of India and Pakistan by Salim Ali and S Dillon Ripley stated that ‘(It) is a common resident. (It) intergrades with (T. s.) malabaricus in Goa and intergrades in north and the east with (T. s.) orientalis’. Humayun Abdulali is well-known from his meticulous cataloguing of specimens in the Bombay Natural History Society. He stated that ‘it has been customary to accept all birds from western India from south Dangs to south Karwar in N. Kanara from both the Ghats and from the low country as T. s. somervillei’. 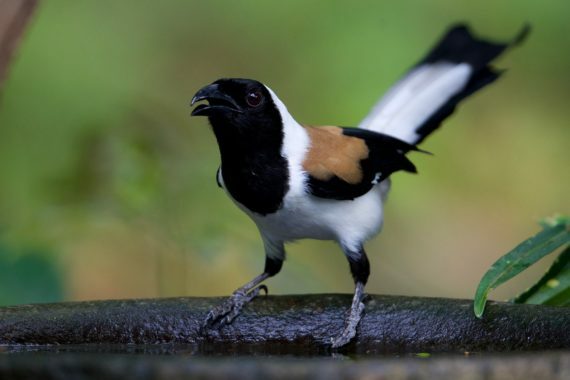 All the aforementioned authors as well as Pamela Rasmussen in her Birds of South Asia noted that the race was strikingly different from other races of the Jungle Babbler in having rufous-buff rump and belly, with a rufous tail and dark brown-black primaries. HBWAlive additionally adds that this species has a vaguely scalloped (vs vaguely streaked) breast. There is no other difference documented in behaviour or vocalization in this race. A cursory glance at the images of this species on Oriental Bird Images and Macaulay Library, especially from Maharashtra, Goa, and Karnataka reveals an interesting fact. Individuals of somervillei and orientalis can be present at the same location as these two images on Oriental Bird Images from Sinhagad (near Pune) show – the first one shows a black-winged while the other does not have any black on wings. We find pictures of Black-winged Babbler from as north as Raigarh in north-western Maharashtra and south till Ratnagiri in south-western Maharashtra. Birds in Goa seem to be a mix of both somervillei and malabaricus. As we go south to Uttara Kannada, Udupi and Dakshin Kannada, the black on wings lightens and almost disappears. It would be worthwhile to analyse why the plumage variance is so drastic in this race from these locations and whether there is any underlying genetic difference, which merits the proposed split. There seems to be no geographical barrier a la the Palakkad Gap, which may explain the variation, nor are the birds isolated from the other races in any other way. For this split to be accepted by all authorities, more evidence in the form of molecular, vocal and behavioural data may be required. It remains to be seen if eBird/Clements will accept this species split in August 2017. Whatever happens with the split, birdwatchers would find it very interesting to document the variation in colours in Jungle Babblers of western India. It is important to take note whether both types of birds are found in the same location or whether they are segregated by habitat or any other local factors. It would also be interesting if birds of the same flock displays characters of both types of birds. When you see such a Jungle Babbler flock, please attempt to document as many individuals as possible with good photographs and also call recordings. You may be contributing to the ongoing research to unravel this taxonomic riddle. Babblers being relatively sedentary would be highly prone for regional variations such as the regional variations in human skin color. Genetic studies should sample adequate individuals from different morphs and regions to pin the different sources of variance before drawing conclusions.